So far this year 106 banks have failed out of 8,195 FDIC-insured institutions, or slightly more than 1% of all banks. How does that compare to previous periods of financial stress and episodes of bank failures, and is there anything positive about bank failures? 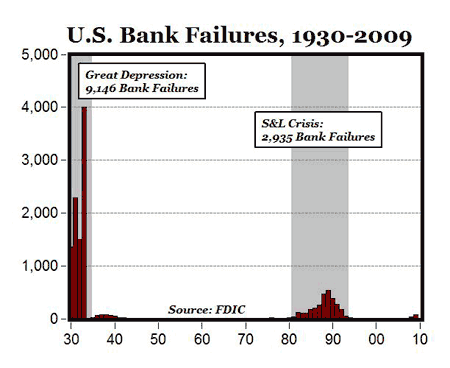 The graph above displays annual bank failures (data here) from 1930 to 2009, showing the two most serious banking crises in U.S. history, the Great Depression (9,146 banks failed from 1930-1933) and the S&L Crisis (2,935 banks failed from 1980-1994). Compared to those two periods, 106 bank failures in a single year out of more than 8,000 banks in total, does appear pretty inconsequential. 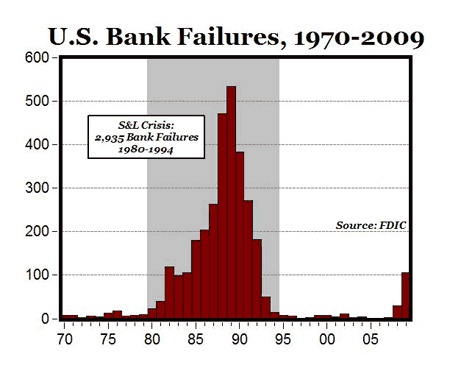 The graph below shows annual bank failures since 1970 only, and puts some further perspective on the 106 bank failures this year, compared to the S&L crisis when almost 3,000 banks failed in total, and there was an entire decade when banks were failing at a rate of more 100 per year. Further analysis shows that the assets of the 106 failed banks in 2009 totaled $106 billion (FDIC data here), which represents only 8/10 of one percent of the total U.S. bank assets, currently $13.301 trillion (data here). During the peak of the S&L crisis in 1989, failed bank assets were 3.5% of total bank assets, or more than four times the current level. Certainly we can expect some more bank failures to follow this year, considering that there were 416 “problem institutions” listed by the FDIC in June. But by comparison, there were almost 1,500 banks on that same list in 1990, and more than 1,000 in both 1991 and 1992 during the S&L crisis. Read more of my bank failure analysis here at The Enterprise Blog.